Interested in crystals but don’t know where to start? I often come across people who see me wearing crystals and are very drawn to them, but don’t know what to get for themselves. There truly are so many wonderful crystals available these days that it may be hard for a beginner to choose. It is very important to go with your intuition and what feels right to you, but there are a few crystals that are kind of a foundation in terms of their effects on those who haven’t had a lot of experience with crystals. They are Clear Quartz, Amethyst, Smokey Quartz, Rose Quartz, Citrine, and Black Tourmaline. While most of the crystals can help with a variety of issues, Clear Quartz is considered to be the most universal and also the most influential for beginners. Its effects are easily observable as greater physical energy and a sense of general well-being. By enhancing the personal energy of the wearer, Clear Quartz protects one from the energies of other people and enhances the immune system function. In this way, it assists in healing. Clear Quartz crystals can be “programmable”- which is a term often used to signify that they can hold an intention of the wearer and provide assistance in magnifying the energy of that intention. It is also the crystal to cleanse and recharge other crystals. It needs to be cleansed weekly under running water and recharged under sunshine or on the soil of a healthy plant. Amethyst attracts a lot of people through its color and its vibrations. The color varies from pale lilac to intense purple, but every type of Amethyst is great for spiritual protection, purification of aura, and balancing the physical, mental and emotional bodies. It assists in meditation and spiritual work, and helps develop intuition. Amethyst is considered extremely beneficial in healing, and it is the premier stone recommended for headaches and addictions. It is calming and relaxing and it increases imagination, inspiration and all forms of creativity. Amethyst should be cleansed under running water for a few minutes and recharged next to a clear quartz crystal or near Hematite. It will change color if exposed to sunlight over a long period of time. Smokey Quartz is transparent, with color that ranges from very pale tan to dark chocolate brown. This crystal is excellent for relaxation after a stressful day, but is also very grounding and protective, especially in a work environment. It is recommended after a period of illness because it aids in recuperation of personal energies. 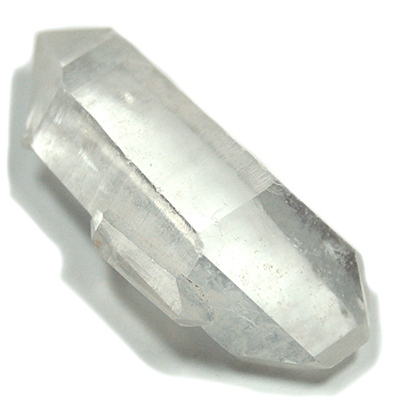 When used together with Clear Quartz, its energies are increased and it works faster. Some people experience its effects immediately, while some report that they need to carry it for a longer period of time to feel the results. It is reported to aid insomnia and bring peaceful dreams. Clear under running water and recharge next to Clear Quartz or on the soil of a healthy plant. Rose Quartz is a universal Love stone and when people hear this, they usually get it to attract new love. While this is certainly possible, it is important to note that Rose Quartz primarily works on self-love and self-acceptance by clearing and strengthening the heart and the Heart chakra. It clears blocks and dissolves resentments left over from past experiences so that we may enjoy the present. For some people, this means bringing up unresolved emotions to the surface, so if you experience this, use a grounding crystal such as Black Tourmaline, which will help you to both get to the bottom of the issue and transmute this into a positive experience. Clear under running water and recharge next to Clear Quartz. Citrine has been known throughout the world and throughout centuries as a stone of luck, self-confidence, and financial prosperity. Often referred to as the “merchant’s stone”, it has been known for attracting business or money to the wearer. Citrine is also a crystal that brings joy and optimistic outlook, as well as self-confidence to the wearer. This stone stimulates the imagination, increasing creativity and clarity of thought. In terms of health, citrine is often used to ease digestive problems and strengthen the Solar Plexus chakra, the seat of our will and personal power. Some crystal writers state that it does not need cleansing, but others believe that it is advisable to cleanse it from time to time under running water. Black Tourmaline is a universally acknowledged grounding stone and a strong protector from “negative” energies - from cell-phones, microwaves, computers, as well as people. It transmutes negative energies into positive, and shields the wearer by increasing its own electro-magnetic field, so that the negativity is repelled. Some crystal writers refer to Black Tourmaline as an “etheric vacuum cleaner” (Simmons); others praise its ability to clear, purify, and balance all chakras and meridians of the body (Hall), while yet others discuss its ability to offer protection on all levels, from preventing “simple accidents to psychic attack” (Permutt). It is a great mineral to hold when one feels spaced-out, forgetful, or disoriented, as it quickly centers and grounds one in the present moment. It can be cleansed under running water and recharged under sun or on the soil of a healthy plant. It is always good to remember that crystals work on many levels and that their effects can be experienced differently by different people. They assist us with our issues through their color, their crystalline structure, and their chemical composition. Some people feel an immediate connection with crystals through their physical and emotional reactions, while others notice the changes but do not necessarily feel the energy of the crystal. That is perfectly normal and depends on too many factors to describe now, but the experience of many crystal workers has been that most people do perceive a variety of positive changes after consistent use of crystals over a period of time. Enjoy learning about what crystals can do for you and write about your experiences on our Healing Crystals Facebook page! Thank you so much for the great information. I was drawn to what I was told later to be Opalite. I saw it an Love it. I didn't buy it the same day instead I bought a Blue Sand Stone with the Chakra stones attached to front beautiful stone. But I couldn't stop thinking of the Opalite so two days later I went back to get it. By the way both are pendulum. I later found out that Opalite is not a gem stone and it's man made. Yet some people say it has healing affects an others say it does not. I love the beautiful color how it changes from light blue almost clear to a sky blue when wearing a dark shirt not to mention the glow it has like a light inside. I would like your thought about Opalite. Just from reading this article I now understand why I have been attracted to all of the above. As a child I had a crystal collection. My mother threw it away. I was able to save only my rose quartz, which I carried in my pocket. It may sound silly but I would talk to it when I was extremely sad and hold it in both my hands. The sadness would pass and I felt better. Sorry for rambling but I am now excited because just by reading this article I remembered memories and knowledge that was lost.